Back in July 2017, I had written about how to setup Mac Book almost at the speed of light using Ansible. I had setup continuous integration using Travis CI. The objective of doing this was to test any changes to the ansible playbook automatically. At that point of time Travis CI provided an option to run the build on a Mac OS. The advantage of doing this was I could test any changes to the playbook without impacting my personal Mac. I had also scheduled to run the build on daily basis. This was really helpful in identifying outdated extensions in Visual Studio Code. I had blogged about this experience in another post how Travis CI saved me from using an unpublished extension in future. Recently Microsoft announced availability of Azure DevOps which is combination of multiple services helping us to achieve DevOps practices. One of the service available under the umbrella of Azure DevOps is the Azure Pipelines. Azure Pipelines allow us to define build and release pipelines. We can use these pipelines for Windows, Linux and Mac. 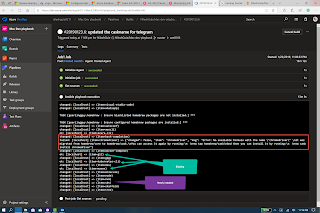 We can make use of the Hosted Mac agent to run the build pipeline which can run the ansible playbook. 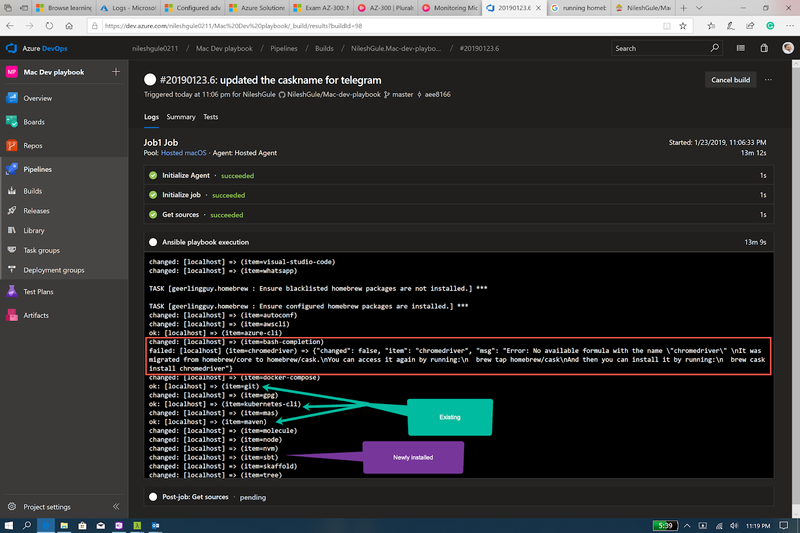 This post is about how I migrated an existing Travis CI build to Azure DevOps build pipeline. Script: Runs the actual playbook. Note on line #39, we are using a timeout setting within Travis CI set to 90 minutes with travis_wait. This was set to 90 minutes based on different builds which took approximately 90 minutes to finish. This is the main part of the whole setup. It runs the ansible playbook with main.yml. There are slight differences Azure DevOps pipelines and Travis CI. Both support yaml files as a way of declaratively defining the build steps. The greatest advantage of this is that the build definition can be scripted and checked into the source code repository. The ability to use Yaml files for defining build is currently available only for build pipelines in the Azure DevOps. The release pipelines are currently defined using visual components but are expected to have support for Yaml in near future. Steps: Defines different steps which form part of the build. We have only a single step which runs the script. As part of the script we install ansible, set up the required variables and run the playbook using the same main.yml file which was used along with the Travis CI build. The main difference between the two scripts is we do not need to install Homebrew and pip in case of Azure pipeline. The remaining steps related to executing the ansible playbook are exactly same. The macOS hosted agent contains truckloads of build tools preinstalled for our usage. Lets trigger the build using a Hosted Mac Agent. After defining the build pipeline in Azure DevOps when we want to trigger the build, we get an option to choose the agent where we would like the build to run. In our case we make sure that the selected agent is Hosted Mac agent. Before we trigger the build, I would like to check the capabilities hosted Mac agent. We can go into the details of all the software packages installed by default on the agent by selecting Project settings –> Agent Pools –>Hosted macOS –> Details. The agent has almost all the tools required for building most common applications in various programming languages like Java, Node, .Net along with the ones for XCode and Objective C. It also has Homebrew 1.9.2 version preinstalled which our Ansible playbook uses. We create a new build pipeline as shown in the screenshot below. The process is is pretty straightforward we choose the Github repository as the source and Hosted macOS as the agent. YAML file path points to the azure-pipelines.yaml file inside the Github repo which contains the build definition as declarative steps. The final step is to Queue the build. Assuming everything is setup correctly, one the build is triggered we can check the real time output log. Below screenshot shows the successful build. The migration was not a lift and shift operation. I had some minor hiccups along the way. First one was due to the changes to the Homebrew packages. Over a period of time Homebrew had made some changes to the core packages and casks. There were some packages moved from core to cask. One such example is the Chrome Driver. I had to move this from Homebrew package section to the casks section. Another one was Telegram which changed the cask name from Telegram to telegram-desktop. Once these minor issues were fixed, I was able to successfully run the ansible playbook. The final output shows time taken for each step in the build. As we can see from the screenshot below it took about 16 minutes to complete the whole build. It was a huge relief to migrate from Travis CI to Azure DevOps build pipeline. One of the biggest benefit I got from this migration is the speed in testing the automation script which runs the ansible playbook. When I was using Travis CI, the build used to take close to 90 minutes to finish. I had to put in a kind of hack to timeout the builds which ran more than 90 minutes. After migration the Azure pipeline for similar set of activities is taking just about 15-20 minutes. That is a huge time saver. Next time I need to set a Mac Book from scratch with all the software I need, I know that I can test it on an independent machine using Azure pipeline and in 20 minutes or so I would be able to identify if any changes are required to my Ansible playbook before I run in on actual laptop. Another advantage I get by using a cloud hosted macOS agent is that any new tool or software I want to try to install, I can test it in isolation first and my main laptop will remain untouched. Isn’t that great? Apart from the benefits to personal users of Mac, the main advantage of using hosted macOS agent is that teams can build their software for iOS using the Azure pipelines. I hope I have give enough pointers for the readers to explore Azure Devops more. You can register for free and use up to 10 build agents in parallel. That is not all, if you have open source projects and public repos you get huge boost in the amount of time the pipelines can be run for free.